Planning for sea level rise to ensure resilient coastal communities is a high priority for local governments, the Coastal Commission, state and federal agencies and stakeholders. 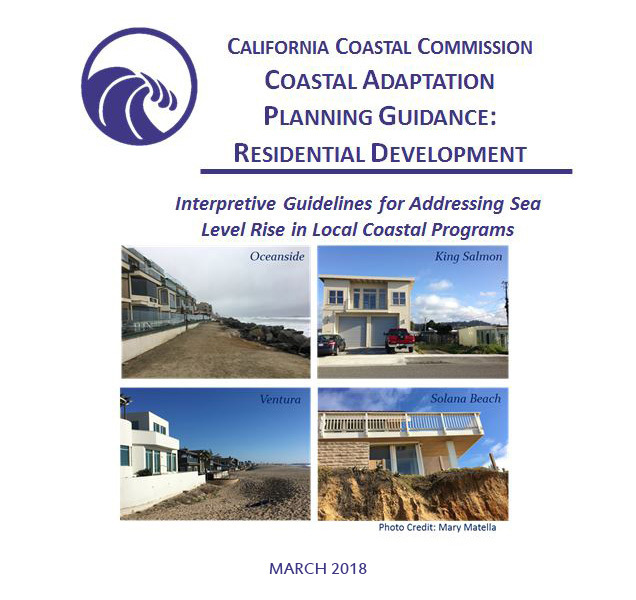 The intent of the Commission’s Draft Residential Adaptation Policy Guidance (Guidance) is to provide accessible information on sea level rise adaptation, and a suite of practical land use policy tools to help facilitate planning for resilient shorelines while protecting coastal resources in Local Coastal Programs. October 2018 UPDATE: We have heard a number of concerns regarding the Guidance. In order to more fully address these concerns and allow additional time to coordinate with our local government partners and stakeholders, Commission staff is rescheduling the public hearings on the Guidance to early 2019. The additional time will allow more opportunity for Commission staff to engage in a more in-depth discussion of sea level rise and adaptation planning concerns in coastal communities with our local government partners as well as interested stakeholders and the public. The continued dialogue will allow Commission staff to factor in additional input to the proposed final document. Commission staff will be organizing additional outreach events in the future. Announcements will be shared via the Sea Level Rise Mailing List.